Named after the fuzzy brown bird from New Zealand, kiwifruit has high amounts of vitamin C packed into its small, egg-sized form. Ripe kiwi will yield slightly when pressed. Its bright green interior bursts with a creamy sweetness that can be compared to strawberries and bananas, and its tiny black seeds have an unexpected crunch. The outer skin of the kiwi is considered edible; however, its prickly fuzz can cause throat irritation in some people if swallowed. Kiwis can be juiced without peeling by straining out the pulp, or the exotic fruit can be scooped out with a spoon after the kiwi has been cut in half. Shaving the fuzzy peel and slicing allows for the most stunning presentation of the fruit. Stand the kiwi on a cutting board so its top end is facing up. The top of the fruit will have a hard, brown circle almost like a button, where it was once connected to the vine. You might even notice the remnants of tiny brown leaves. The bottom of the kiwi will yield more easily when pressed with your finger. Poke your paring knife gently through the skin just outside the brown circle located on the top of the fruit. Make a shallow cut, angling your knife toward the kiwi's center. Slice through the skin and follow the circle all the way around. Pop out the small, hard cone attached to the kiwi top and discard. The center core of a kiwi is white, soft and sweet; the bit attached to the kiwi top is also white but hard and bitter. Shave off strips of the brown skin by holding the fruit with the top end still facing up, start at the edge of the cut circle, and peel downward. If the fruit is especially ripe, the skin may peel right off with a gentle tug, or you may have to slice it off in strips using your knife. Turn the kiwi slightly, cutting and peeling additional strips until the fruit is clean. Lay the kiwi down on its side. Using your paring knife, cut off the bottom end of the kiwi, along with any strips of skin that may still be attached. Discard the fruit peels. Slice your kiwi. If the fruit is especially soft, cut slices about a quarter of an inch thick. It’s best to consume your kiwi soon after peeling and slicing, because its strong enzymes will begin to break down the fruit, giving it a soft and mushy texture. For use in recipes, kiwi fruit can be peeled, sliced and stored for up to a week in the refrigerator, but for best results, store kiwi separate from other ingredients. Kiwi can serve as a natural meat tenderizer. 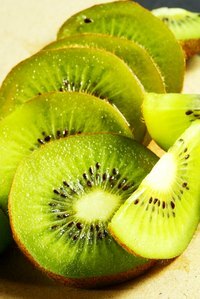 Rub or place slices of fresh kiwi over your meat, allowing it to sit no more than 10 minutes before removing the fruit. Excessive contact can cause the meat to break down due to the strong enzymes. Cook your meat immediately after tenderizing. Fruits such as peaches, pears, apples and plums emit ethylene, which can quicken the ripening of fruit placed nearby. Keep ripe kiwi in their own bowl to preserve their quality. Because of the strong enzymes in kiwi, it does not make a good fruit topping for yogurt.